How does the Inline UV work? The Inline UV™ system is specifically designed to treat microbiologically contaminated ground or surface waters. These disinfection systems offer a 4-log reduction (99.99%) in bacteria, virus and protozoan cysts (specifically Giardia lamblia and cryptosporidium). The Sterilight process is quick, simple, inexpensive and environmentally friendly as it does not add anything to your water and creates no disinfection by-products. Sterilight is the most ecological way of treating your water...and all this just for pennies a day! Applications include private wells, camp grounds, hotels, bottlers, aquaculture, hospitals, food, cottages, restaurants, breweries, water systems, laboratories, marine, pharmaceutical, dairies and many other applications. 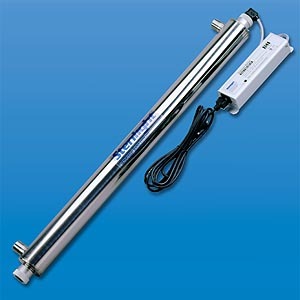 The Inline UV system is installed directly inline with the plumbing pipes for easy installation and maintenance. Note: We also recommend a 0.35-micron Absolute Post Filter to capture the remains of any cysts and micro matter that may be present in your water. How may we further help you with the Inline UV? You may also want to consider the following systems which would install in-line, just before the Inline UV system, unless otherwise noted. After adding the Inline UV system to your shopping cart, you may click the "Continue Shopping" or "Back" button to return here so that you may make your next selection below of the complete PureMaster™ V-Series™, FluorideMaster™, HardnessMaster™, or the Combo Package. HardnessMaster™: electronic water conditioner which provides an effective and healthy alternative to water softeners and descalers. Set it and forget it. NO more salt! Installs in-line before the Inline UV system. PureMaster™ V-Series V-300, V-500 or V-700 Premium Whole House Water Filtration Systems: highly-specialized systems designed to filter chlorine, chloramine, VOCs, THMs, atrazine, benzene, pesticides, insecticides, tastes, odors and hundreds of other potential contaminants and harmful chemicals from the water entering your home. FluorideMaster™ Premium Whole House Fluoride Filtration System: highly-specialized system designed to filter fluoride from all of the water entering your home. Note: We also recommend a 0.35-micron Absolute Post Filter to capture the remains of any cysts and micro matter that may be present in your water. 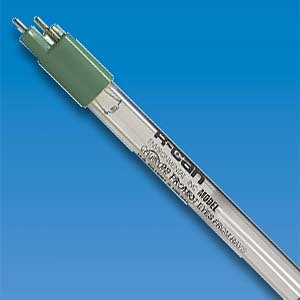 You may buy the recommended 0.35-micron Absolute Post Filter together with the 1" Inline UV system below. Note: The Inline UV systems require the lamp/bulb to be changed on an annual basis (if installed in a seasonal home, replacement schedule will depend on overall usage). How does the Inline UV system work? Above diagram represents a general UV system configuration. The Inline UV system is specifically designed to treat microbiologically contaminated ground or surface waters. Our Inline UV water disinfection systems offer a 4-log reduction (99.99%) in bacteria, virus and protozoan cysts (specifically Giardia lamblia and cryptosporidium). The Inline UV system uses UV light at a wavelength of 254nm (nanometers), and is not visible to the naked eye. This portion of the electromagnetic spectrum is termed UV-C light or a germicidal wavelength. The source water to be disinfected flows in through the 'water inlet' port and then through the chamber where it receives UV dosing of 254nm. At this 254nm wavelength, microorganisms undergo a genetic alteration which ultimately results in inactivation. Finally, the disinfected water then flows out the 'water outlet' port. Note: We also recommend a .35-micron Absolute Post Filter to capture the remains of any cysts and micro matter that may be present in your water. Visual Lamp Failure System: YES; Inline UV systems require the lamp/bulb to be changed on an annual basis (if installed in a seasonal home, replacement schedule will depend on overall usage). Audible Lamp Failure System: YES; Inline UV systems require the lamp/bulb to be changed on an annual basis (if installed in a seasonal home, replacement schedule will depend on overall usage).